1. Cook the basmati rice with 2 cups of water and keep aside. 3. Add the carrots, beans, mint leaves, mushrooms, baby corns, green chillies and ginger. 4. Saute well for 3 minutes and remove. 5. Add salt and mix well. 6. Combine the vegetables and rice in a large bowl. 7. Add coriander leaves and mix well. 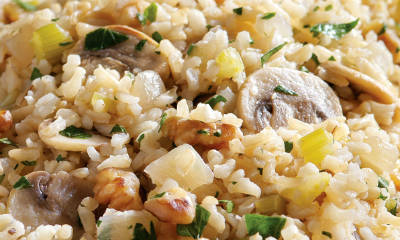 Feel free to comment or share your thoughts on this Mushroom Vegetable Rice Recipe from Awesome Cuisine.